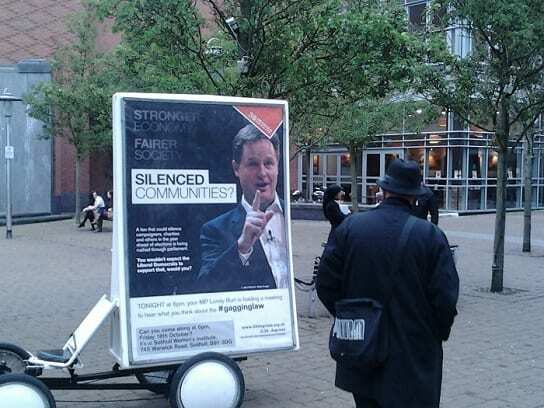 Followed successful campaigns against nuclear waste storage in Cumbria, NHS cutbacks across the UK, and election debate in Eastleigh, lobbyist organisation ‘38 Degrees’ turned again to mobile billboard contractor Gorilla Media to voice objection to what has become known as the Gagging Law proposed by the UK coalition government #NoGaggingLaw. This time Gorilla AdBikes were briefed to cover specific constituencies where the MPs for that area were staging public meetings on the issue. The objective of the advertising vehicles was to ensuring people attending the meeting were aware of public opinion against the legislation and the public at large were encouraged to attend helped by the distribution of leaflets by the ad bike rider. The advertising bikes also offered the opportunity for TV and press to use mobile posters as a backdrop for photographs and interviews. Following last Friday’s 38 Degrees Gagging Bill promotion, I just wanted to let you know how helpful your man Tony was throughout the whole day; as well as the town centre presence, he became a living interactive signpost to the actual event itself, outside the hard-to-spot venue. As well as his presence and his leaflet distribution, his frontline feedback about the promo material itself was shrewd and helpful for the future. He doesn’t mind putting in the hours either. . . Thanks to you and your AdBike team for helping us make the most of a short-notice event.